Don Baird brings his knowledge of psychology and love of humor to every endeavor, from speaking and writing on humor and coping to teaching graduate students in clinical psychology. 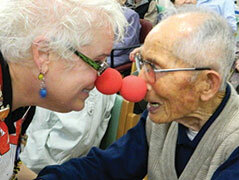 Don has given presentations on humor nationally and internationally, from Chicago to Montreal to Osaka. He is a former AATH board member who has presented memorial tributes at our conferences with Bobbe Lyon for over a decade. Ester Hyatt attended her first AATH conference in 2008. Although dealing with severe pain, she found relief with the laughter and joy experiences with her AATH friends. Her ability to laugh through the many challenges in life, and her dedication to AATH led to the creation of the Spirit of AATH Award. Esther was the first recipient of this Spirit of AATH Award given in 2011 at the AATH Orlando conference. Before failing health curtailed her travels, Esther also attended our annual conferences in Chicago and San Diego. Esther Hyatt passed away peacefully in the early morning og October 6, 2015. Her estate bequeathed a generous gift for AATH that will be used for future scholarships. 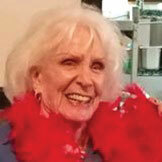 Her friends in AATH are forever grateful for the shared laughter and joy that Esther shared with AATH. Chip Lutz works with leaders who want to lead better, get more done, and leave a legacy. A retired Naval Officer, under his command as Commanding Officer of two different Naval facilities, both his teams received national recognition for setting new standards of service while maintaining high morale and high retention among team members. He also knows about meeting critical objectives during stressful conditions – having served as the Director of Security for Naval District Washington, DC during September 11th, 2001 – where he was responsible for the safety and security of 25 thousand people on 6 different Naval installations in the National Capital Region. Currently, Chip is the President of Unconventional Leadership and is also the Past President of AATH and the Wisconsin Chapter of the National Speaker’s Association. This award is in honor of Ruth Wiltz, mother of Mary Kay Morrison. Ruth continued to crochet even after developing Alzheimer's disease. Her creations were named Doily Lamas by the AATH family and sold as a fundraiser at the AATH Conference in 2015. Linnea Heintz - I am the Disability Services Director for Absolute Pediatric Therapy in Bentonville, AR, where I oversee all Developmental therapy and develop Individualized Family Service Plans for children in the Early Head Start Program. I also coordinate the Occupational, Physical, Speech, Developmental and Mental Health Therapists that serve our pediatric clientele, and serve as Corporate Compliance and Licensing Manager for New Beginning Children’s Homes. The last several years I have conducted numerous studies revolving around the utilization of laughter and its effect on society. I aim to pioneer change one laugh at a time. I look forward to the AATH conference every year as it is a way to rejuvenate my passion and strengthen my resolve. I laugh when no one else will. Created to recognize those who have contributed to our knowledge and understanding of the many roles humor plays in our lives. Because of the very nature of the subject, it is difficult sometimes for the researcher to be taken seriously, and therefore, to get adequate funding and support. It is hoped that this award will help give the individual recipients, as well as the field of Humor studies the recognition they so richly deserve. 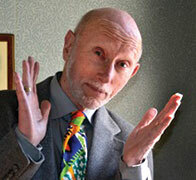 Dr. Lee Berk has a strong background in the field of psychoneuroimmunology. He is a pioneer medical researcher and recognized for his studies on positive lifestyle behaviors (eustress) with humor associated mirthful/laughter and the initial research with endorphins and immune modulation with exercise. He has done research on music, religion and spirituality, and anticipatory perception with their effects on stress hormones, neuroendocrine and immunomodulation --- since the early 1980’s. Dr. Berk’s research examines the positive emotions and their biochemical/physiological effects to the whole-person through the field of psychoneuroimmunology. He is currently the Director of the Clinical Molecular Research Laboratory in the School of Allied Health Professions, Associate Director of the Cardiovascular and Physical Fitness Lab., Associate Professor in the School of Allied Health Professions, Research Associate Professor in the Department of Pathology and Human Anatomy, School of Medicine and Faculty in Graduate Studies at Loma Linda University, California. Dr. Ziv was a widely published author, the founder of the International Conference on Jewish Humor, and a visionary. He was a Professor of Educational Psychology at Tel Aviv University in Israel and was a major early contributor to humor studies. He passed away on Wednesday, November 9, 2011 at the age of 82. Dr. Ziv’s dream was to build a center for humor research in a university setting, which would have a collection of humor books, articles, papers and dissertations on humor, all to help facilitate the productive, therapeutic use of humor. His acceptance speech centered around the story of how he became interested in researching humor. During one of the many wars Israel has had, a team of researchers was called upon to study the effects of the stress on the children at various Kibbutzim. Ziv was one of the researchers. After all the psychological tests had been administered and calculated, they found that two of the Kibbutzim had children who were experiencing far less stress than any of the others, even though the number of bombings near them was the same. Upon investigation, they found that at both sites the children clung to an older child (approximately 13-14 years old), and that in each case, the so-called “magnet child” had a quality completely overlooked by the researchers: a sense of humor. “He makes me laugh—even when the bombs are dropping,” one girl told Ziv. “I started to study the values of humor during stress because of the war. But now the war is over, and I keep studying it – I just can’t stop myself,” he told the audience. The year was 1989 when a brochure arrived in the mail announcing a conference on the Positive Power of Humor and Creativity and the lineup was impressive. Why not go? So off I went and it changed my life forever. Allison Crane approached me at that conference and told me she was also starting a humor organization called The American Association of Therapeutic. And so my association with AATH began. I went on to become a member of the AATH Executive Board and co-chaired three conferences with a lovely, zany group of new AATH friends. The nicest job I’ve had recently has been to co-present the memorial for the funny folks who are no longer with us. I am honored and touched by the Heart & Soul award and I thank you. The biggest bonus, for me, as a member of AATH has been the friends I’ve met. Don will be accepting this award for me since health issues have kept me home. This recipient honors a person who has demonstrated heartfelt empathy and support towards members of the AATH family and a deep commitment to the AATH mission. Debra Joy Hart - Mother Teresa said, "Peace begins with a smile." I said," I can do that. I can create peace, one red nose at a time." In 2011, my 1000 Red Noses(TM) Project was born. I was taught to give back to my community either of my time, talent or treasure. Being a minister, nurse, clown, art teacher, certified laughter leader, death educator, mom, wife and (best of all) Bubbe, allows me to give to others in a variety of ways. This is the Universe's way of keep me from being bored AND out of jail! How does it get any better than this? This recognition is given to recognize extraordinary volunteer service to the AATH mission to study, practice and support healthy humor. Jill Knox, CHP is a speaker and humorist who has, as long as she can remember, incorporated humor in daily living and as a survival tool. As an educator, her use of humor in the classroom led her to a career as a speaker and founder of The Funnyside, providing workshops and keynotes to colleges, school districts, health centers, and women’s groups emphasizing the power of humor at work, play, and daily living. Jill is a passionate believer in life-long learning and in recent years has enjoyed, but not yet “mastered” playing Steel Pan, and Ukulele. She is currently continuing her path to enlightenment as a student of The National Peace Academy in order to earn a Peace Building/Peace Learning Certificate, knowing that humor and laughter are the gateways to a peaceful world. This recipient is a person who has demonstrated ceaseless passion and commitment for applied humor in teaching and/or participating in the Humor Academy. Jennifer Keith - I’m a 19-year veteran high school English teacher/turned technology coordinator/turned doctoral student in Educational Leadership, retired at the end of last school year to write online curriculum from home. Overcoming the hardships of losing my sister to a car accident, and recently losing my mother to a stroke, myself at times in work and other vices, humor has and will always be my saving grace. The Humor Academy Level 2 is on my horizon, as well as serving as Chairman of the 2019 AATH Conference. I plan to use this experience to jump start the next season of my career and life as I promote humor, creativity and play in education. We have to bring the fun back to education and kids. Given to a person who has exhibited leadership skills and volunteerism within the first 3 years of membership in AATH. Through his books and his presentations, Klein shows people worldwide how to use humor to deal with everything from traffic jams to tragedies. He is a best-selling author, former president of the AATH board and an award-winning professional speaker. His honors include an AATH’s Lifetime Achievement Award, a Certified Speaking Professional designation from the National Speakers Association, and a Toastmaster’s Communication and Leadership Award. In 2007, Hunter College, The City University of New York, inducted him into their Hall of Fame. Klein is also a best-selling author of 26 books including, The Healing Power of Humor, The Courage to Laugh, Learning to Laugh When You Feel Like Crying, You Can’t Ruin My Day, and now, Secrets Kids Know…That Adults Oughta Learn. This award is given to a member of AATH who has contributed an outstanding new book that illustrates the use of humor in theory or practice.